On The Cusp: 11-Year-Olds Around The World Share Their Wisdom : Goats and Soda Age 11 is when you're most passionate and optimistic, says Australian filmmaker Genevieve Bailey. So she created a documentary looking at the world through the eyes of 11-year-olds in 15 countries. Not children anymore — but not teenagers either — 11-year-olds are on the cusp of adolescence. That gives them a unique perspective. Age 11 is when you're most passionate and optimistic, says Australian filmmaker Genevieve Bailey. It was her favorite age. She was the happiest then. 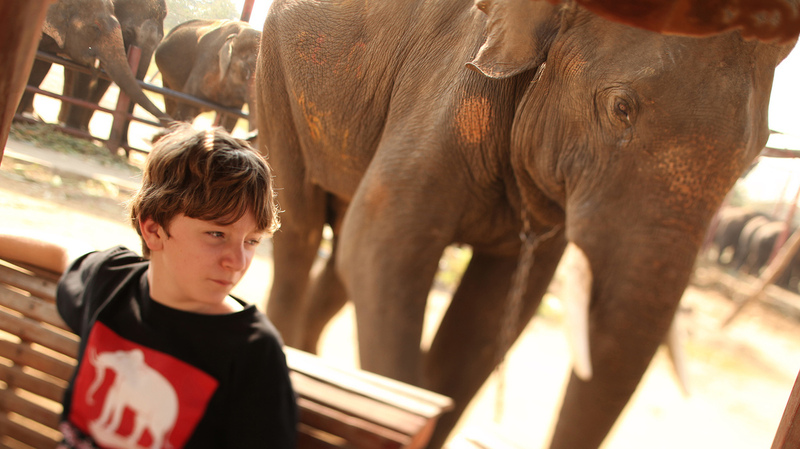 Jack, 11, lives in Bangkok and spends a lot of his time at an elephant sanctuary. If you have a headache, he says, put your head against an elephant and "within seconds, your headache just goes away." So in 2005, Bailey set out to document the lives of 11-year-old girls and boys around the world. The project took her six years. She traveled to 15 countries, from India to Morocco to the U.S. And she worked several jobs to pay for it all. The result: I Am Eleven, a 90-minute documentary that offers people a look at the world through the eyes of dozens of 11-year-olds. The film has been screened around the world since its debut in 2011. It began playing in U.S. theaters this month. And each child's story is different. In Thailand, Goh grew up near an elephant sanctuary. That has made the 11-year-old boy very compassionate toward animals. Thousands of miles away in Bulgaria, Giorgi won't walk past a certain point in his neighborhood because that's where children get hit by cars. It's All About The Girls: Is The World Listening To Them? And in India, the 11-year-old kids at the orphanage take on adult responsibilities. They look after the younger kids, waking them up for school and preparing their meals. Contrary to what some might think, Bailey says, the boys and girls at the orphanage are among the happiest kids she met. "I think a lot of people who live in the developed world would not think that children in orphanages were having fun," she says. "But the kids in India were very mature in their ability to have perspective and resilience. A lot of them had had very difficult early childhood experiences, but I found that their sense of humility was very, very strong." Across the board, she says, maturity is measured quite differently. Take Remy in France. The 11-year-old boy has profound insights on love. There are three kinds, he tells Bailey: love for your family, love for those who are always with you, and finally, love for people you don't know. In India, the kids in orphanages have largely been sheltered from global and political issues. Their maturity, Bailey says, shines through the care they give to the younger children. "The children who were 11 were getting up early to make sure that the children who were 7 had their dresses on in time. And the children who were 7 were getting up early to make sure that the 4-year-olds had their breakfast before going to kindergarten," Bailey recalls. But the 11-year-old kids all have a few things in common. "They all had this sense of hope and the belief that things are possible," Bailey says. At one point in the film, she has the kids list their aspirations. In the West, many wanted to become actors, singers or dancers. For instance, Osama and his friend Sahin in Sweden both want to become successful rappers. "I am Muslim," Osama says to the camera. "But that makes no difference. Even if I wasn't, I would still rap." But in poorer places, kids' goals were more about giving back to their communities. "What I found was that across the world," Bailey says, "the kids in more developing parts of the world were interested in being nurses or teachers. ... It is interesting to see how influential our community, and our sense of community, is on these young people." For the most part, adults are out of the frame in I Am Eleven. "I never wanted an adult telling the kids what was right and what was wrong," Bailey says. When she met Siham in Morocco, "every man, woman and donkey came out to see what was going on," she says. Everyone was yelling at Siham what to say to the camera: "Tell her your family is poor," one woman yelled. "Tell her we don't have electricity," another suggested. In the end, Bailey and Siham outran the adults toward the top of a mountain, the filmmaker says. "That's when Siham really came to life on screen," singing and dancing with her friends.